The density of air varies with barometric pressure and temperature, both of which decrease with an increase in altitude (Olds et al. 1995b). 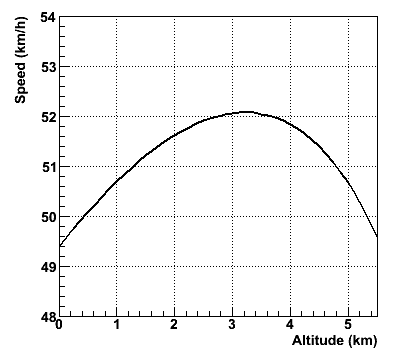 where PB is the barometric pressure in mmHg and H is the altitude in km (West 1996), which is shown in the figure on the right. 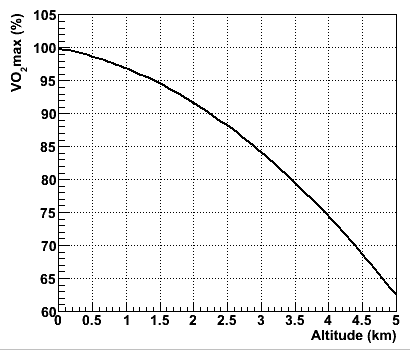 If we assume that cycling records will be attempted at a temperature around 20 o C, the air density is just a function fo the altitude: So it is obvious to go as high as possible, isn't it? where KA is the VO2max expressed as a percentage of VO2max at sea level (Basset et al. 1999), see figure on the right. So for example at 4 km altitude the athletes VO2max has decreased to about 75% compared to sea level. with different values for r at different altitudes, the power output of the athlete PRider has to be reduced in parallel. 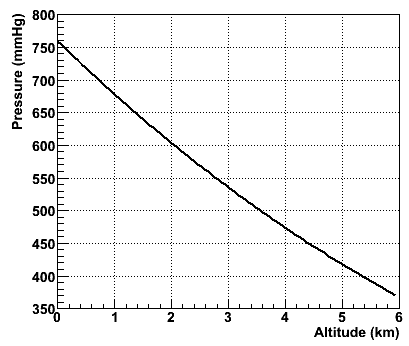 The result is the predicted hour record as a function of the altitude. The effect is clearly to see: If one takes Boardman's hour record at sea level of ca. 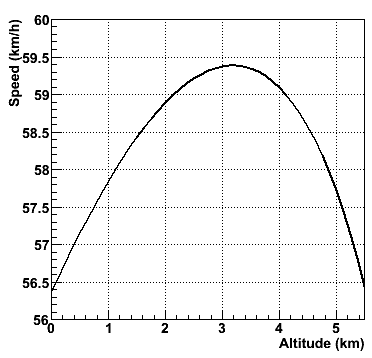 56,375 km/h, with increasing altitude the speed increases more an more, until a maximum of about 59,4 km/h is reached for an altitude of about 3200 m. At higher altitudes the velocity decreases again. Similar results (optimal altitude around 3000 m - 3500 m) were found also by other authors. So in principle the velodrome in La Paz (Bolivia) at 3400 m should be perfect. Its interesting that the Mexico City velodrome at 2230 m should already give an advantage of about 2,5 km/h ! For the UCI hour record with standard bikes the results are comparable, Chris Boardman's attempt of 49.4 km/h would be around 51,7 km/h at Mexico City. So, comparing Eddy Merckx at Mexico City and Chris Boardman or Ondrej Sosenka at sea level, this makes their records even more impressive.